I’ve loved Carmenere wines ever since I tried my first one. There’s something about this particular grape which is fantastic. Carmenere’s are exclusive of Chile as far as I can tell. That particular grape grows in that area because of the optimal climate and soil conditions of the area. As I’m posting this, I’m enjoying a fine glass of this wine. 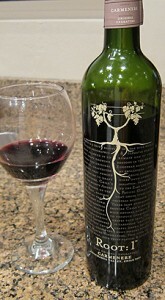 I picked up a Root: 1 Carmenere about a week ago simply because it was on sale and I knew that I liked Carmeneres. The Root: 1 has moved up to a position as one of my all time favorite wines. The price is right too, locally here at $10-13, which means it is sub $10 in other places. Since that first purchase, I’ve picked up two more bottles. The last bottle I bought, the lady at the cash register raved about Root: 1, saying she and her husband loved it. She was all excited. Me too, lady. Me too.